Twin Speak:DressCode: Jazmine Sullivan Isn't Busting the Windows Out Your Car Right Now But She Is Shopping! Jazmine Sullivan Isn't Busting the Windows Out Your Car Right Now But She Is Shopping! 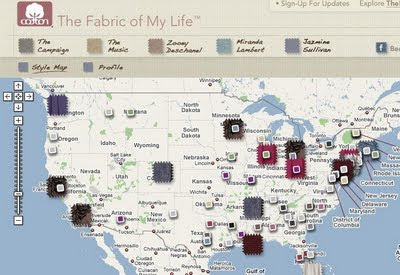 The new campaign for Cotton: The Fabric of Our Lives has a phenomenal map of the U.S. which uses fabric swatches on a map to show where Jazmine, Zooey D. and Miranda Lambert Shop. It's a very organic way of engaging interested parties in looking a very well-edited selection of clothing and stores throughout the U.S. The ladies (why no men?) give us the inside scoop on what influences their unique style.